Following retirement some ten years ago, our second vehicle was only used occasionally and the battery gradually became discharged. It was discovered that whilst the alternator can supply up to 80 Amps to power ancillaries, the battery typically charged at only a few amps. The immobiliser, clock and radio were found to draw about 26 ma on standby, and although that is small, it is enough to discharge the battery by about 50% in a little over a month. The vehicle would ideally need to be run for about 30 minutes every day to make good these losses and the power consumed by the starter motor. Modern vehicles are fitted with a lot more electronics placing an even heavier strain on the battery, especially when fitted with start stop technology, so it is important to keep the battery in tip top condition. If your vehicle is only used occasionally it is advisable to check and, if necessary, charge the battery every month or so. Likewise if your vehicle is garaged for the winter it is advisable to disconnect the battery plus trickle charge it every one to two months at about 1 Amp. It is recommended to charge 'maintenance-free' car batteries with a modern smart charger. These charge at a relatively high rate to start with, then switch to a lower rate and finally trickle charge using a regulated DC supply which reduces gassing compared to older unregulated chargers. 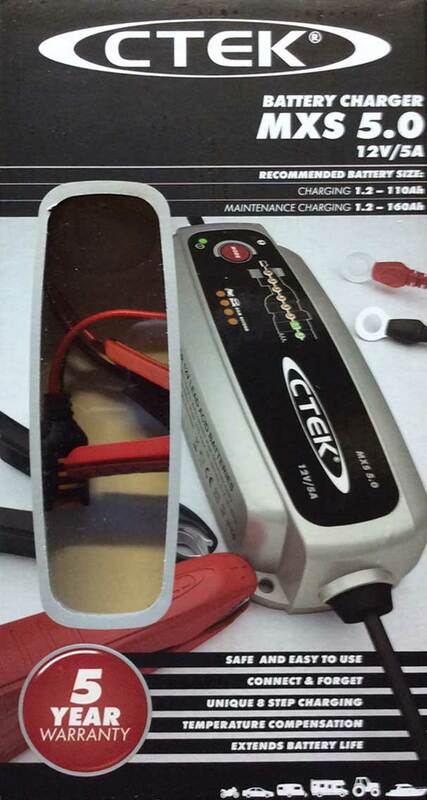 Examples of such chargers are the CTEK MXS 3.8 and CTEK MXS 5. 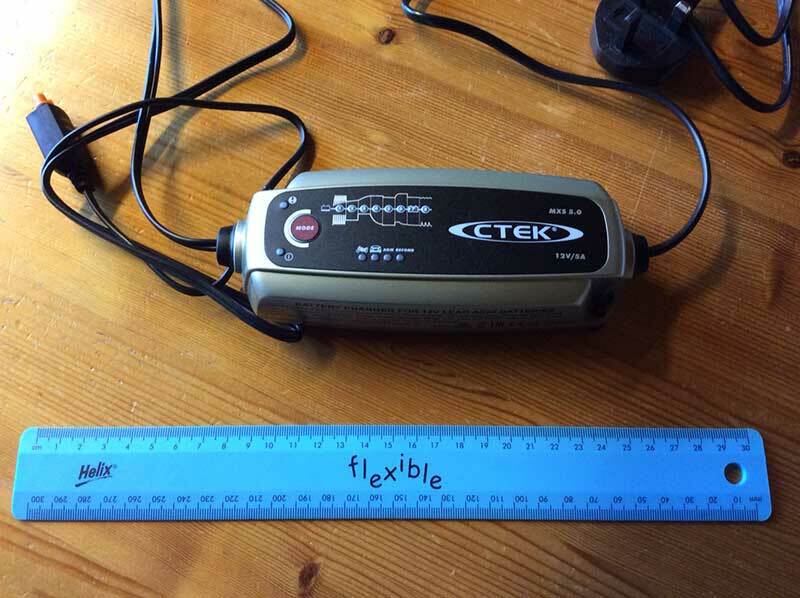 The CTEK charger is small, splash resistant and can be, subject to precautions, safely left connected. You can buy it from Halfords, on-line from Amazon, and other stores. Its case is made of plastic, so don't drop it. 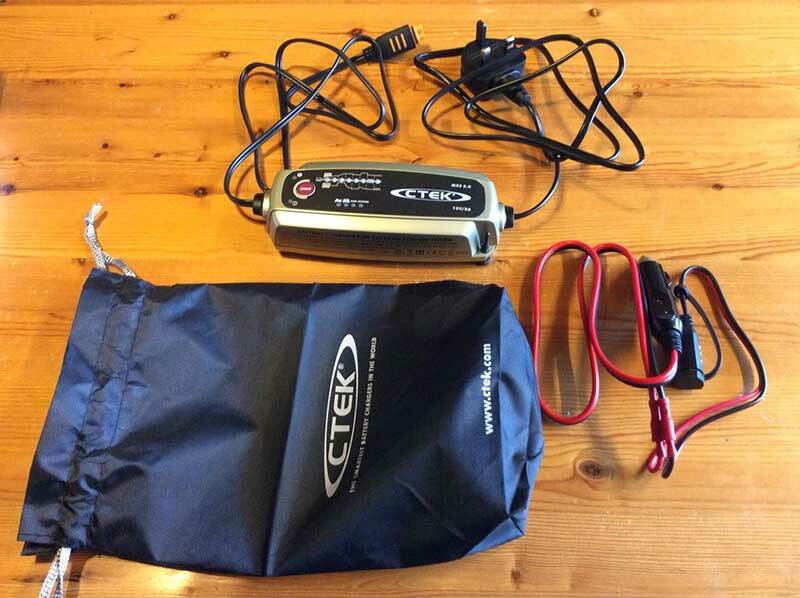 The CTEK charger comes with a storage bag and the option either to connect the 12V connector into a short lead with eyelets, or crocodile clips for direct connection to the car battery. In our case we snipped off the eyelets and crimped on a cigarette lighter plug to enable charging through the cigarette lighter socket - you can buy a CTEK adaptor ready made. Other makes of charger are available. We thought about putting the charger indoors and running a long 12V cable out to the car, but calculated the resistance of the lead would probably upset the smart charger. Better to run a mains extension lead from a Residual Current Circuit Breaker (RCCB) out to the car; but take care water does not run down the cable into the socket and that the cable is not trapped in the door or window. 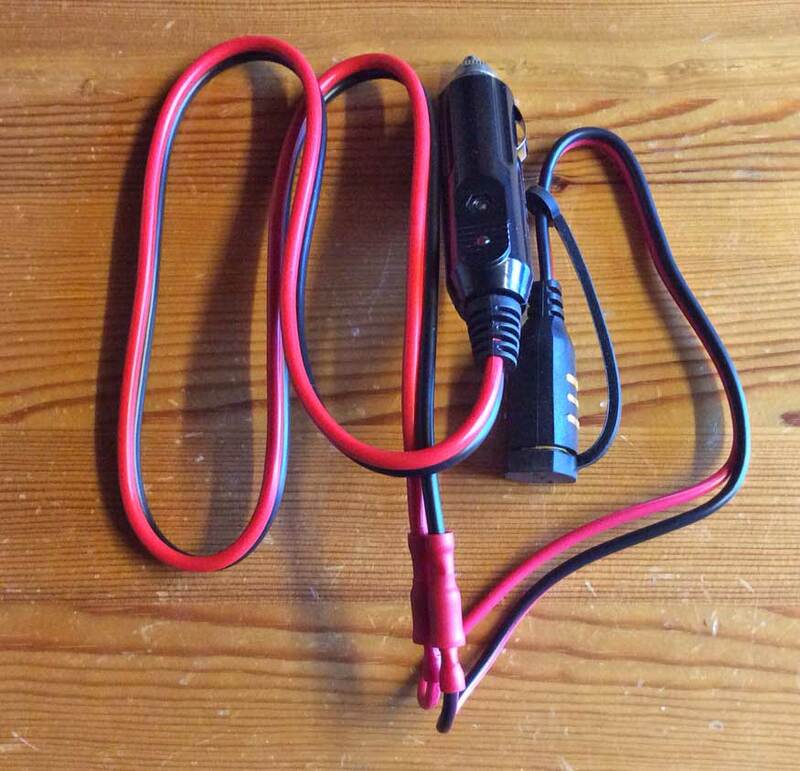 If you want to try a 12V extension lead we recommend you consider using a flexible cable rated at 20 Amps, for charging at 1 to 5 Amps, to minimise the voltage drop in the cable. At 25 deg C the open circuit voltage of the battery should be about 12.7 V when fully charged and about 12.4 V when 50% discharged; slightly less when cold. This can be checked with a digital multi-meter, eg first thing in the morning - before turning on the ignition. National Luna in South Africa manufacture a Battery Monitor with a row of LEDs which shows the state of battery charge quite accurately and can be used to indicate when the battery is likely to benefit from a charge. This too can be plugged into the cigarette lighter socket with a suitable plug, so you don't need to lift the bonnet. These are also available for dual battery installations for 4 X 4 and caravan installations where a separate battery is provided eg to run a winch or fridge. The National Luna Battery Monitor can be purchased in England from APB Trading near Kidderminster and in Scotland from Quothquan Workshops. Due to Health and Safety legislation, in 2012 many car batteries were being made in Pakistan and 're-badged' in the UK. There appear to be very few comparative tests of automotive batteries, and though manufacturers advertise premium versions you will probably find that your local dealer offers only a standard battery with a three year guarantee. Buy from a reputable supplier, checking that the battery was manufactured recently, keep the guarantee, and charge the battery when you get home as it is unlikely to be fully charged if it has been on the shelf for a couple of months. Older batteries had Lead Antimony plates but newer batteries are more likely to be Lead Calcium possibly with Silver added. There is speculation that although the newer batteries should last longer they may be more difficult for older vehicles with regulators set for 13.8 V to charge. It may be that a Lead Antimony battery will be better for a classic car than the latest Calcium technology. In any event the advice is the same - the voltage of infrequently used car batteries should be monitored, and ideally the battery occasionally trickle charged with a smart charger. Spiral cell technology batteries such as the Optima and Exide Maxxima, and Absorbent Glass Mat (AGM) batteries are more robust but more expensive so only likely to be justifiable for specialist applications, for example vehicles with stop start technology and 4 x 4 vehicle bumping over rough ground. Case sizes, filler caps and terminal positions vary but typically, for older Land Rovers, a Type 72 battery is called for and a Type 69 battery can sometimes be used as a fallback - consult your handbook to check which battery is recommended for your vehicle. The Ford Focus owner manual states use only a 'silver' battery which has a slightly higher terminal voltage than batteries obtainable from most tyre and battery centres. Some later Fords are fitted with 'Calcium' batteries.